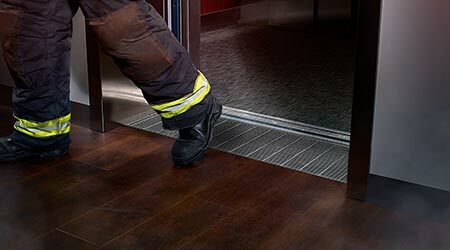 The Z899 Stainless Steel Elevator Trench Drain System provides a 100 gpm flow rate to prevent water from cascading into the elevator shaft, allowing fire personnel access and egress in the case of an emergency. Designed to fit in front of any elevator door or bank. The drain was designed initially to meet California Building and San Francisco Fire Code but is positioned to meet emerging codes as well. Stainless steel heel-proof grating keeps foot traffic moving. A shallow installation still provides proper drainage with a 2 1/4-inch to 3 1/40-inch depth. Available in lengths from 36 to 96 inches with bottom center or end outlet configurations. Grate removes for cleaning and maintenance.